Delivered September 2012 by the Rev. Deby Veach. Since Chip announced his retirement, there have been a lot of questions about my role here as deacon and if that role will change. 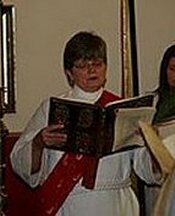 Now is a good time to share about deacons and their role in the Episcopal Church. Lets look at how the role of deacon started and evolved through the years. Deacons are an order of Christianity. Just as Christianity draws its roots from Judaism, so does the order of the diaconate. Servant ministry to the less fortunate was of great importance to the Hebrew people. From the Ten Commandments to the Holiness Code in Leviticus, we can read about relief for the poor, justice for the oppressed, and care for the sick. Jesus told his followers that when we feed the hungry, clothe the naked, and care for the sick, we are caring for him. Service and ministry to the poor and oppressed was a central part of Jesus’ preaching and of his active ministry. And from the earliest days of Christianity, servant ministry has been considered an essential part of following Jesus and calling oneself a Christian. The early church had ministers—later called bishops—who were overseers of the churches. Care of widows, orphans, the sick, and the poor was an important part of the life of the church, but the ministers found they could not take care of everything by themselves. So men and women from each congregation were chosen to lead others in this ministry. These servant leaders later became known as deacons. Early deacons worked closely with their bishops. Deacons were even considered to be servants and personal attendants to their bishop. Deacons serving early bishops who were martyred even faced their own deaths with their bishop. Early deacons were special servants of the bishop but a principle part of their ministry for the bishop was to see to the needs of the poor and sick and to identify those in need to the bishop and to the church. They were to bring alms to the poor, and they encouraged the baptized to help in ministry to those in need. Deacons were the eyes and ears of the bishop in the community. In those early days, both bishops and deacons were elected by the laity. They were not considered clergy until the third century, but they were not laity either. They were somewhere in between. After they were elected, they were ordained on the next convenient Sunday. The process was very short in those days—nothing like the five-year process for my formation. A third-century document describes deacons as both male and female. They stood by the bishop during the liturgy, guarded the door and the alms, acted as ushers and sergeants of arms, made announcements, assisted at baptisms and did anything else the bishop asked. After the Emperor Constantine made the Christian church legal, the order of presbyter or priest was added. Priests were in charge of parishes. Deacons were viewed as servants of the bishop and thought of as lower then priests. They were not allowed to sit with the priests. By the end of the fourth century, deacons were defined by what they could not do. They could not bless. They could not baptize. They could not offer up the Eucharist. Deaconesses were treated with even less regard. This was a period when the church became very interested in the hierarchy of rank among its ministers. While deacons did not vanish, their roles were diminished and changed drastically over the centuries. Little is said about them after the eighth century. By the Middle Ages, the focus was on the Mass, and so the priest became the central figure of ordained ministry. The diaconate became primarily a transitional office for men studying to be priests. This Roman Catholic practice continued in the Anglican church after the Reformation and later in the American Episcopal church. Since the early 1800s, however, the Episcopal Church in America has recognized four additional types of deacons: male missionary deacons, deaconesses, male perpetual deacons, and today’s perpetual deacons, who can be both male and female. The 1970s was the transitional period in establishing the diaconate we recognize today, in which both men and women could be ordained as permanent deacons. Becoming a deacon, in other words, did not mean you were going on to the priesthood. The diaconate was finally recognized as a full and equal order. Even though deacons serve under the supervision of the rector, the deacon promises to obey his or her bishop. Deacons are assigned to parishes by the bishop as he or she sees a need. We are to bring to the congregation needs we see in our community or world. We are to remind our congregations of our baptismal covenant that in serving others, we are serving Christ. In worship, a deacon’s role reflects what we do in our everyday lives. We are servants, taking care of those in need, and we are angelic messengers, telling others about Jesus and his Good News. During the first part of our service, the Liturgy of the Word, deacons assume the role of angel, messenger, and bearer of good news when we read the Gospel. We also invite the congregation to pray for those in need during the intercessions, and we preach from time to time. During the second part of the service, Holy Communion, deacons assume the servant role of butler, preparing the table, then receive, prepare, and place on it the bread and wine. After the meal they eat the remaining bread and wine and then wash the “dishes.” The deacon is also the wine steward. The deacon stands at the presider’s right side and lifts the cup at the invitation to communion. The dismissal at the end of the service is also a part of the deacon’s angelic role of making announcements. The deacon sends the congregation out to love and serve the Lord. There are some things deacons are not allowed to do. According to the canons, no deacon shall be in charge of a congregation or other community of faith. While deacons attend vestry meetings and have a voice in the discussion, we do not have a vote. Deacons also do not do “A, B, or C”; they do not Absolve, Bless or Consecrate. Only bishops and priests can perform these functions. When I lead Morning Prayer, therefore, I ask God to have mercy on us, to forgive us all our sins and to strengthen us in all goodness and to keep us in eternal life. A priest would use you instead of us. These canonical restrictions mean that I cannot take the priest’s role in this congregation. But as your deacon, what I do here will not change. I will continue to look for outreach opportunities for us and fulfill my role in our services. I will take also continue taking your blood pressures and listening to your medical questions. But, most of all, when I preach, I will be reminding you of the baptismal covenant we renew each year and look for ways to help you live out your promises.